Are Your Grounds Up To Standard? Inex takes great pride in ensuring the outside of your building is of the highest standard. Our Exterior Maintenance team carry out civil engineering works, hard landscaping and planned property maintenance. Further to this, roofing and exterior repair works are also within the skillset of our technically astute team. Taking pride in ensuring a high standard of quality and timely completion, our Civils division has grown rapidly. With the ability to provide both installations and repairs to a large range of surfaces, our specialist knowledge of products and services enables us to meet clients’ needs and often exceed their expectations. 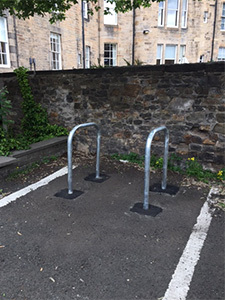 Due to open spaces on their commercial sites near Edinburgh, the Savill's team were finding that people were parking within unauthorised areas, causing damage to walkways and leading to problems with pedestrian access. Following a thorough assessment of the sites and making allowance for access and provision for sufficient parking spaces, Inex provided painted manhole and drainage rings planted onsite, offering a simple and attractive cost effective solution.